Dijana's Designs is a hand design jewelry and accessories online boutique. I love the look of her items and even more, I love that she hand made each piece of jewelry herself. 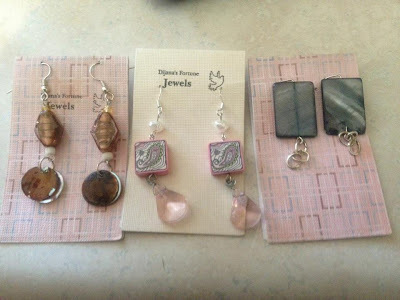 I had the opportunity to try out three different sets of earrings. I absolutely loved them all. I’m very big on my jewelry and I spend way too much money on it, but hey, I'm a girl, it's what we do, lol. The earrings are very feminine and very durable. They aren't some of those pieces of jewelry that are homemade and break easy, which was something that I was concerned about when wearing them. I love all the different colors that are all mixed together and compliment each other so well together. Her items would be amazing gift ideas to give to someone in your life that is big on jewelry for Christmas since it's just around the corner or keep them as a gift to yourself. Another thing that I found special about each of the set of earrings I got to try is that inside each of them came a little script on the inside, "True happiness...arises in the first place, from the enjoyment of one's self." -Joseph Addison. What a perfect little touch to something so beautiful and different. This definitely made me smile and made my day. So if you’re looking for something special the person next to you does not have on check out her website, she has some beautiful unique items. Disclosure: All opinions are my own. I received three sets of earrings at no cost for the purpose of this review. No other compensation was received. Thanks to the company for the giveaway prize!